Skype is suffering serious connectivity problems worldwide and it seems like it is affecting just the Skype PC versions. Skype for iPhone, iPad, Mac and Android seem to be working fine. However, video and voice calling with Skype PC versions seem to throw this error. 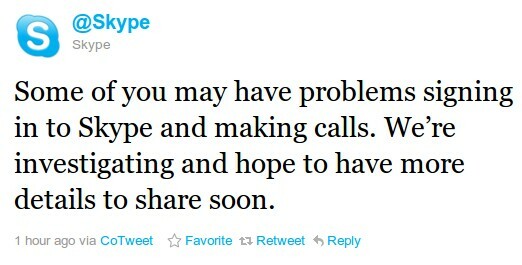 @skype has ackownledged this outage in their twitter feed. Some people are just seeing the following error message. Skype has stopped working. A problem has caused the program to stop working correctly. Windows will close the program and notify if a solution is available. Hope this will be just a minor problem to Skype and they can address the problem soon so that their users can enjoy and use the system again worry free. I hear that Skype has been bought by Google? God help us, I gues we’ll all be paying through the nose to use it soon.